Today, at St. James, thanks to Chad Caton’s tireless work, hundreds of volunteers will arrive with 200,000 bags to fill. Homes will be saved. “One of the problems Chad made me aware of in this effort, was having volunteers onsite and needing materials. He called me on Friday concerning sand bags. Volunteers and sand were onsite, however, the team had run out of bags. I then reached out to S.C. Highway Commissioner Tony Cox telling him of Chad’s issue. Today, 200,000 bags will be delivered to St. James School so that work can continue there.” Added Jones, “Chad helped people who needed diabetic supplies, medical supplies and food. 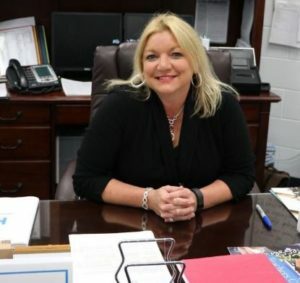 His get it done approach to all things crisis is amazing to witness,” Angie Jones – Horry County Treasurer. Horry County resident Chad Caton spent the better part of this week in a truck on the phone. MyrtleBeachSC news asked Chad if he would help Socastee residents organized by Martine Rochelle and Terri Jean who had reached out to us on Facebook. 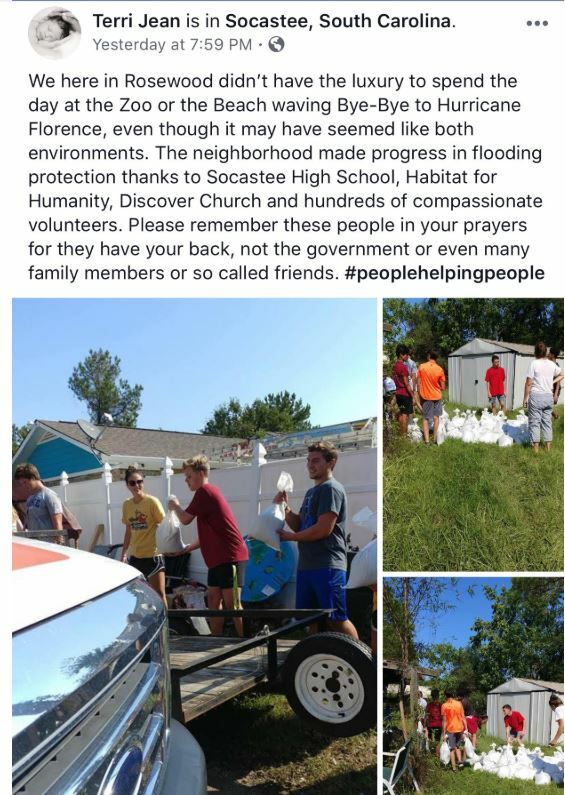 The Socastee community was in a mad dash to beat flood waters, evacuate their homes, find new places to stay, sandbag their homes, and save the very homes they were evacuating. Caton did not blink. He and his wife Elizabeth spent the better part of all week planning, leading, organizing, running errands, and offering support for the team. His work was as a non paid, volunteer, neighbor helping neighbor effort. From 7 a.m. daily to late in the afternoon, Chad was on the scene and on the phone. Caton, a former Horry County fireman, was injured fighting a fire a few years past. His back was broken, leaving him unable to lift the weight of a sand bag. However, Caton lifted the Spirits of all in the Socastee community this past week. He rallied a team of firemen to the location to help fill and lift sand bags into a caravan of cars in need. Chad would be the first to say this was a team effort. We couldn’t write this article without thanking Jaret Hucks of the Midtown Motel who made every room available to the residents at Rosewood. Hucks is another community giant. When Chad introduced our news team to Terri Jean of the Socastee Rosewood community, she embraced him with tears in her eyes. Later she posted the below. 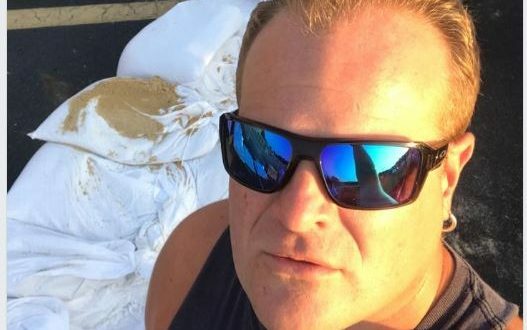 Unfortunately, one local City of Myrtle Beach leader saw Chad in his truck and did not understand why he was at the Socastee High School not lifting Sand Bags. She called our news team and stated he needed to leave as he was not working and “only” sitting in his truck. She personally asked him to leave the property. While she had no authority nor jurisdiction in Socastee, Chad chose to honor her request. The Socastee effort was a non political movement of neighbor helping neighbor, but as can happen in such, sadly out of jurisdiction politics found its way in. Myrtle Beach would prefer to allow Chad to state the unfortunate political events of yesterday in his own words.